At the lower level of the reserve are winding strips of alluvial grasslands crossed by various rivers, home to many species of deer. JIM Corbett National Park, popularly called the Corbett tiger reserve, is considered one of the Asia’s greatest wildlife national parks. Established in 1936, the reserve offers a wonderful spectacle of wildlife for the visitors. Spread over more 500 acres of forest, the park encompasses a spectrum of existence — on land, in the sky and water. This showpiece of Uttaranchal is one of the most fascinating and awe-inspiring ones, as nature is at her best here. The national park is a perfect habitat for mammals, reptiles and birds alike. This includes the elephants, tiger, leopard, wild cats, deer, wild boar, alligators, crocodile, snakes and lizards. More than 580 species of residents and migratory birds have also made their home here. This incredible species of flora and fauna at the national park is a perfect example of the healthiest food chains present this side of the world. Almost all major groups of animals known to exist in the Himalayan Terai and the Bhabar foothills are found here. Sharp spurs in the terrain make it a perfect habitat for the tiger. Jim Corbett National Park is situated in the Shivalik Range and is intersected by Ramganga, Sonanadi, Mandal and Palain rivers. This paradise is situated, at an altitude between 400 to 1000 meters, covering at total of 520.82 square kilometers, was established as Hailey National Park, named after the name of then Governor, Sir Malcolm Hailey. Later, the park was renamed after the famed hunter, author and wildlife conservationist, Jim Corbett, who spent major part of his life for the preservation of life— human and wild. Under Project Tiger it was made a Tiger Reserve. Jim Corbett is said to have made his mark as a soldier and a hunter. He later dedicated himself to the cause of preservation of wildlife. Popular in Kumaon and Garhwal villages as ‘Carpet Sahib’, Corbett is believed to have known the forests like the back of his hand. He walked for days to reach whenever a maneater threatened the villagers. It is said that he could understand the sounds of the animals and imitate them also. With his exceptional ability he could lured the animals for a face-to-face encounter. Two maneaters shot by him were the result of this special talent. Corbett’s home at Kaladungi is now a museum. The surroundings of this small village is called Chhota Haldwani. Older village folks still have tales to narrate about the ‘ Carpet Sahib’. They say Corbett, with his own little savings, bought a part of the village land. He later gifted his property to the villagers. He was a keen photographer and had authored eight books. 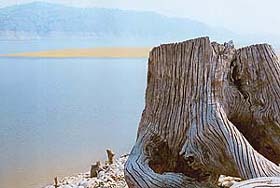 A dried tree trunk on the bank of the Ramganga. Massive deforestation was done at the time of building the dam. Alligators, crocodile and fish like can be seen here frequently. According to the forest guides and text available in the forest library at Dikhala, Jim Corbett National Park has sal and mixed woodland that spans the outer Himalayas. The rich biodiversity makes the park a natural haven for the flora and fauna of the plains, sub-mountainous regions and high-altitude areas. At the lower level of the reserve are winding strips of alluvial grasslands crossed by various rivers, beloved to many species of deer. 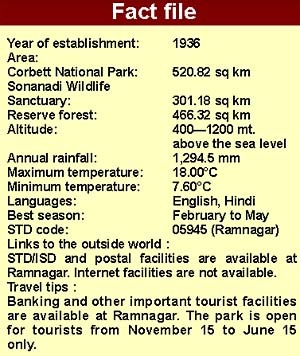 Ramganga is said to be the lifeline of the park. It provides a safe home for mahaseer fish, crocodile and otter. 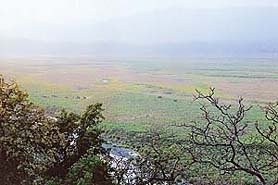 Large stands of sal and diverse mixed forest cover hills and valleys providing fodder and foliage for herds of elephants. Sharp spurs in the terrain make it a perfect habitat for the tiger, that is—contrary to popular belief—a shy animal. Corbett Park is also a delightful educational experience. Understanding this very well the forest department provides 50 per cent discount to Indian students. 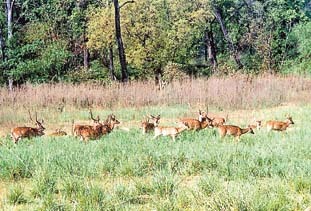 The protective environment of the park has helped keep some endangered species safe and thriving, like the hog deer, which has been virtually saved from extinction. The park, our forest guide told us, is also the home of the rare Indian pangolin. But one has to count oneself lucky to spot one! The rare fish-eating, long snorted gharial is a common sight on the banks of Ramganga. Several endangered species breed comfortably in the park, at ease with life-supporting biodiversity. The leaves rustling and the sharp smell of freshly-crushed vegetation is a signal to become alert to the fact that the elephant herd is nearby. , warned our guide. But the herd smells you before you can even spot it. Interestingly, baby elephants are the first to squeal. Elders immediately move closer to them almost covering the cute baby beast. They keep standing protectively till the visitors are gone. On the way deep inside the forest very often a lonely tusker in ‘mast’ condition looms large. Often, at night they would come inside the Dhikala Rest house campus and break a wall and frighten the visitors. The firecracker burst to scare them also scares the other wild animals away, which come in the campus for the night. Seeing elephants in the wild is a raw, exhilarating experience. The Corbett National Park is the best place in northern India to be able to observe them from fairly close quarters. According to the forest guides, nearly 550 Asiatic elephants roam around the park in herds, along the Ramganga foraging into the grasslands. The view of the forest from the top of the machaan is beautiful. One can see a major part of the forest from this height of 60 feet. In the evenings, one can even be lucky enough to spot a tiger drinking water. Jim Corbett in his book, Maneaters of Kumaon, narrates when he was fishing, the air was filled with the fragrance of flora and songs of a multitude of birds. He opined that angling in such an atmosphere is a sport fit for kings. After catching a 50-pound mahseer, he concluded that the sublime surroundings in which he had caught the fish will not be forgotten, and will draw him back to this valley, which to date still unspoilt by the hand of man. Fishing with permits can be done only in areas outside Corbett National Park and Sonanadi Wildlife Sanctuary and only between October 1, and June 30. The mahseer is a fresh-water fish, which our guide said could attain a huge size. The fish eats snails, crabs and algae. The golden or Himalayan mahseer is the main species available in the Ramganga and Kosi rivers. The silver and black mahseer and goonch are other species that also thrive in these rivers. 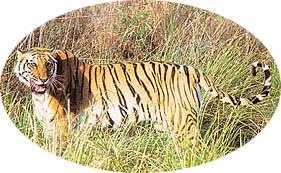 Dhikala, the base point for visiting the wildlife is connected with a fair weather road with Delhi, Lucknow, Almora, Nanital. Delhi via Moradabad. Kashipur and Rampur is 240 km. Pant Nagar, the nearest airport is 115 km from Dhikala. Ram Nagar is the nearest railhead. Chief Wildlife Warden, 85, Rajapur Road, Dehradun. Phone 0135-744225. Director, Corbett Tiger Reserve, Ramnagar. Phone 05947-251489, 251376. Accommodation other than private hotels outside the park is available at Dhikala, Khinnaaanauli, Sarapduli, Bijrani, Kanda, Sulatn, Mailani, Lohachaur, Halduparao, Marghatti, Sendikhali, Mudiapani, Dhela, Jhirna and Kalagarh. Entry with firearms is strictly prohibited. Smoking, cooking, eating non-vegetarian food and liquor is also prohibited. Walking and trekking inside the forest is also not allowed. Driving after the sunset is not allowed. Blowing of horns and playing loud music is to be avoided as this might irritate the animals. Elephant safaris and 4X4 vehicles (basically jeeps) are considered a good way to watch the forest life. Such vehicles are also available at rents starting from Rs. 1500 per night at Dhikala, at the Ramnagar office. The park is open to tourists from November15, to June15. Entry without a permit is not allowed. Other nearby places of interests are Sitabani, Garjia Devi, Kalusidh, Kalagarh dam, Kaladungi Corbett Museum and Nainital.